WERIAN is a Blackened Doom Metal Band from Germany. “Animist” is their first full length although they have several demos, a compilation album, and a split under their belt already. Don’t be fooled by the small number of tracks—this album is indeed a full length, as the total combined running time is about 50 minutes in length. 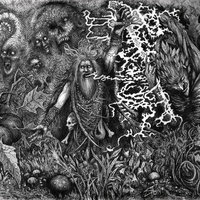 WERIAN play Doom that is infused with Black Metal and even some psychedelic elements. Given the length of the tracks, it shouldn’t be surprising to know the songs take their time, with a lot of build up that, fortunately, comes with a lot of rewards. Each song has so many different sections and elements to it the lengths really don’t seem that long. With that being said, if you don’t like Doom with longer structures to the songs, this won’t change your mind and make you a fan of the genre. These three tracks contained within are a very specific type of music for a very specific type of person. I am one of those types and if you are still reading this, I assume you are too. The Blackened elements come into play mostly with the vocals, which consist of a throaty growl with that classic Black Metal shriek to them. Musically, the bands plays a variety of styles and I’m glad to report that each song isn’t fifteen minutes of nonstop tremolo picking. Often times, the songs are a mixture of classic Doom bands such as SABBATH and PENTAGRAM. They don’t sound like those bands but the jam sessions of riff after riff is definitely prevalent, as is a classic rock influences along the lines of DEEP PURPLE or URIAH HEEP. The first track, “Hex,” is actually the shortest at under thirteen minutes but contains a lot of great moments. The opening movement builds up a chilling scenario with windy sound effects mixed with spoken word portions. The bass guitar really steals the show here, providing everything from groove to a psychedelic trance like cadence. The guitars start out clean and simple but gathering up more and more elements in their storm until it blows apart the roof at 3:32 with the hellish vocals appearing from a dank hole in the ground and riffs so thick it is almost suffocating. The song quickly moves up tempo with a beat I found myself nodding my head too, something that doesn’t happen often in Blackened Doom; it just furthers shows that WERIAN are unable to allow themselves to be pigeon hold into their own sub genre. The song’s last minutes end strong with the whole band coming together, especially the drums which provide an unconventional approach to this type of Metal, choosing appropriate beats and drum riffs that compliment the songs rather than a nonstop attack of the snare job like so many BM bands unfortunately do; the drums are definitely more Doom and Rock focused but their perseverance is as tight as anything in extreme Metal. The second track, “Blade of Heresy,” starts with some ambient and atmospheric undertones. They are appropriately dark and grim, as all Blackened music should be. The vocals themselves are even more brutal this time around, a grotesque display of inhuman vocals that somehow fit the music which is, at times, surprisingly catchy and groovy. The song has a bridge in it around the nine minute mark, which is highlighted by the bass, like a monster lurking through a cloudy murk. The whole passage is spacey and a bit frightening; the instrumentation crawls out of the lurking darkness to finish with strong riffs and drums. The final track, “March Through Ruins,” and longest at seventeen and a half minutes, begins, after a brief intro, with a mighty bite from the guitars. This song is the most riff oriented of the three and adds some classic thrash moments to the overall mix—this one gets very speedy but does settle down into some good old fashioned Doom around the halfway mark, accented by precise drumming and clever use of distortion. This portion grows into a more melodic passage but the harrowing vocals keep things firmly grounded in the darkness. This is probably my favorite track on the album because it just gets the imagination moving very well. While listening, my mind came up with images of intrepid explorers coming across ruins long since lost to the annals of time. They aren’t sure what they are going to find but they are bombarded by feelings of doom and a darkness better left untouched. To find music that can evoke such images within is powerful indeed and these three tracks displayed on this album are a representation of the power of Metal and the thought provoking ideas it can spark.